DeDeNet GmbH’s story of success is closely linked to the great advance of the World Wide Web. 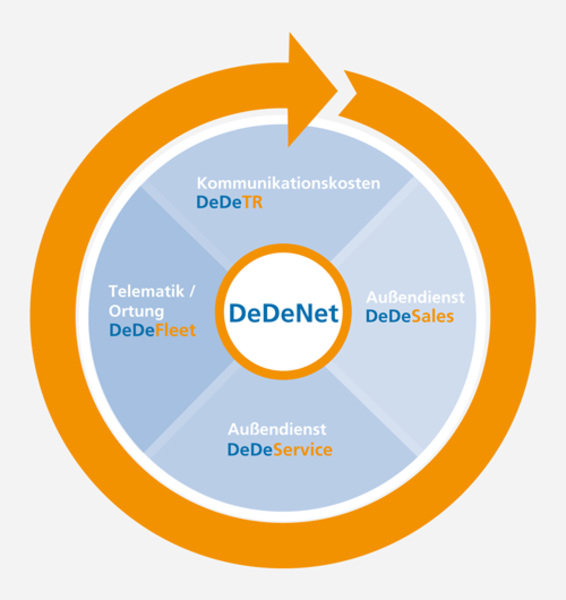 When the company was founded in 1996 as DeDeNet Internet- und Multimedia-Entwicklungen GmbH, Gernot Dähne and Lutz Döring were encapsulating the spirit of the time: the release of the internet for commercial use at the start of the 1990s meant that the demand for professional company presences grew at an incredible pace. As the Managing Director of Dähne Verlag, from which DeDeNet Internet- und Multimedia-Entwicklungen GmbH was initially formed as a subsidiary, Gernot Dähne recognised the need to transfer the publishing side and magazines to the internet in order to boost the publishing company’s sales as well as its profile. With his partner Lutz Döring, who had already programmed and marketed his own goods management software very successfully, the solid foundations for establishing the web agency were laid. DeDeNet’s portfolio of services at the time comprised HTML, Java and Flash programming, web design, e-commerce and content management systems, and was geared towards the creation of websites for SME-sector companies. After just three years, the workforce had grown from four to ten, with the team looking after over 100 corporate clients from the company’s offices in Ettlingen and Echte. DeDeNet attributes the development of mobile software solutions and, as a result, the company’s establishment as an IT software and service provider, to the many years of in-depth industry expertise provided by its founders. However, detailed knowledge of the product development processes for FMCGs (fast-moving consumer goods) and the sales routes associated with them, coupled with comprehensive IT expertise and a profound understanding of service, formed the basis for the development of the first mobile solutions. The rise in online advertising and electronic retail around the time of the millennium were also an additional driving force behind development. Alongside the demand for landing pages to link online banners, the need arose for a mobile sales force solution to optimise processes for e-commerce shops: WWSMobile (today DeDeSales) was born. From 2001 to 2003, DeDeNet was able to increase its sales by 50 per cent and by this point was looking after over 200 corporate clients. Since 2005, DeDeNet has been a principal partner of T-Systems and since 2008 has brought together twelve further well-known partners under its roof as a “Telekom Certified Partner”. 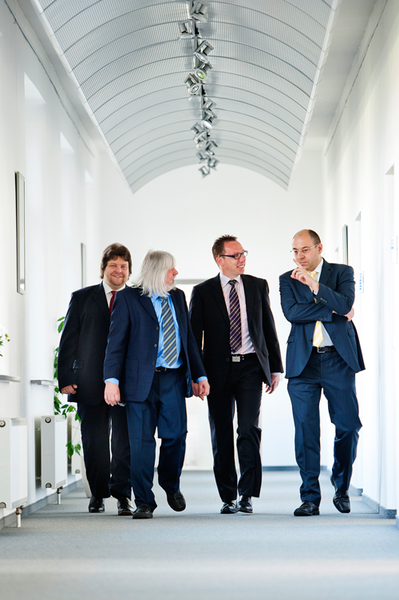 The company is also a founding member of the “Göttingen Innovation Cluster”. DeDeNet GmbH currently employs 30 people in its Management, Sales, Sales Back Office, Marketing, Software Development and Support departments. DeDeNet GmbH regards itself as a partner offering mutual respect and IT services that always put the customer first. All of the team’s members have their roots in the service sector, ensuring a fair and partnership-style approach to clients and delivering very high standards of customer satisfaction. The philosophy within the company is one of community and mutual trust, as well as dedication and professionalism from each individual employee. As an SME-sector firm, DeDeNet is able to respond with much more flexibility to customers’ wishes than large-scale software providers. The flat hierarchies of the owner-managed company also help to ensure the rapid implementation of customers’ wishes and, as a result, the development of new functions and their integration into software solutions. Through the combination of professional advice, customisable and configurable solutions, prompt technical implementation and comprehensive customer support, DeDeNet is able to not only create solid company foundations, but also the basis for successful business relationships. DeDeNet GmbH develops comprehensive and integrated mobile software solutions for virtually every requirement in modern IT. With these solutions, DeDeNet gives SME-sector companies from industry, retail and the service sector customised IT solutions to optimise their everyday business transactions, especially in the fields of sales, service and logistics. Beyond its portfolio of products, DeDeNet also regards itself as a comprehensive IT service provider that supports its clients from the initial advice to the roll-out phase and on through to support and maintenance. With mobile solutions customised to the company’s specific needs, as well as optimised process integration, every client receives a perfectly tailored, personal, full-service package. DeDeSales is a mobile order entry solution for the sales force to improve process handling. Orders are entered digitally directly on the client’s premises and archived, ensuring they are immediately available to every employee. This means the error-prone practice of double entry is avoided, as is the separate dispatch of orders by email or fax. Orders are also transferred just seconds after they are entered for further processing by the back office. This shortens lead times and prevents order backlogs. Thanks to access to all of the details, from master data, article lists and offers to previous sales agreements and individually negotiated terms, the sales force employee has all of the key information quickly to hand both online and offline at all times. With DeDeSales, orders are entered directly via notebooks, tablet PCs and MDE devices, and transferred via interfaces to the company’s own ERP system such as SAP, Microsoft Dynamic NAV, Infor, SO or SAGE, for further processing. The all-in-one solution also provides tools for the time-efficient planning of routes, as well as for simple expenses billing or the creation of day reports. DeDeSales also provides managers with various analysis functions for the evaluation of sales and order figures in order to boost the sales department’s efficiency. DeDeSales is aimed at manufacturing companies or retail suppliers who market a broadly differentiated range of products via a large pool of sales force staff. Through its specialisation in the FMCG industry, DeDeNet is the technical market leader in this field with its mobile sales force solution. With the browser-based B2B online shop system, DeDeSales offers its clients the ability to order directly online at any time and independently of any visits by a member of the sales force team. DeDeTR is a browser-based application for the analysis of communication costs. The software is used to import, process and analyse incoming EDI invoices or invoices in other formats from the online portals of various telephone providers. Invoices are then distributed automatically and digitally within the company and stored in a central database. All of the data from programs used to analyse communication costs, such as Excel, can be imported easily into the application. The user is assisted by an intuitive user interface that allows the fast and straightforward merging and further processing of invoice data with the centrally maintained master data. System prompts also alert the user to the automatic extension of mobile phone contracts or when numbers exceed cap limits. The modular structure means that DeDeTR can be custom-adapted to the company’s processes. The assignment of different user roles means that cost centre managers are integrated into the document verification process via workflows and employees are assigned tasks that are documented after completion in a corresponding summary. Additional graphic and spreadsheet analysis tools provide controllers with efficient tools for the rapid and transparent evaluation of all relevant data. DeDeFleet is a GPS fleet management system for the management of fleets and the security of transported goods. The telematics and vehicle location solution offers real-time fleet monitoring and control as well as the use of a tamper-proof driver’s logbook which is transferred directly to the back office. DeDeFleet can be integrated easily via an interface into the company’s own transport management software and provides comprehensive functions such as live and route views, tank reports and theft protection, driver efficiency analyses and route reports. From simple vehicle location and complex driver evaluation to remote downloads of digital tachographs: with the three versions ECO, BASIC and PRO, every customer can choose the level of service they need. Managers can also use numerous analysis and controlling functions such as downtimes, the transfer of ancillary costs or route reports for individual vehicles to boost efficiency. Automatic notification in the event of the unauthorised movement of vehicles or departure from a specified zone allows DeDeFleet to offer comprehensive theft protection for fleets and high-quality transported goods that must be kept secure. DeDeService is a software solution for mobile time documentation and efficient data management, and is aimed at service companies offering mobile customer service such as craftsman businesses or construction firms. The solution can be integrated easily into existing company software through interfaces and offers users not only transport processes and structures, but also the fast digital entry of all working times and material consumption directly on site, along with access to key client data and constant availability via email and telephone. The mobile and modular software solution also supports schedulers with route planning, the processing of client or supplier data and the creation of work and client reports. Decision-makers and managers also have useful tools at their disposal for optimising the effectiveness of projects and the utilisation of the workforce. In light of the Minimum Wage Act introduced in January 2015 and the detailed recording of working hours required as a result, DeDeService also supports mobile workers: the rapid and straightforward digital entry of working, driving or break times via mobile devices means that additional form-filling is kept to a minimum. Your experts for mobile IT solutions for more than 20 years.